Cloud infrastructure is the de facto industry standard. More and more organizations are putting infrastructure in the cloud, whether they are leveraging Infrastructure-as-a-Service solutions, Platform-as-a-Service, or even Software-as-a-Service. There are certain truths you can count on in the IT industry that every admin knows. One IT truth is that every time after a new, core technology or capability is introduced, then management tools immediately start to appear in order to control it. The cloud industry is no different, as evidenced by the wide variety of cloud management platforms that have already cropped up like Google Apps or G Suite, AWS, Office 365, Azure AD, and many more. Some of these platforms are broad ranging solutions that will help manage cloud identity and access management. These capabilities can include the ability to spin up and tear down instances, monitor them, and sometimes even secure them. Other platforms exist that focus on specific areas. These could focus on application performance or orchestration. There are a number of different platforms out there, but none of them excel at managing users and their access rights. This is a critical part of managing cloud infrastructure, whether that is IaaS, PaaS, or SaaS. The introduction of the cloud created challenges that IT admins are still struggling to solve. How do they control identity on remote infrastructure? How do they ensure that those identities are secured? If there is an on-premise directory, what role does that play? All of these questions are a small part of what we at JumpCloud are trying to solve with Directory-as-a-Service. The core of our management platform is the ability to centralize identities, secure them, and ensure that we save IT admins time. Isn’t that what management platforms are for? Your users are input into JumpCloud. This can be done manually, through import, or even through a connection to an on-premises Microsoft® Active Directory®. The next step is to connect the directory to your IT resources including your servers and applications. You have a couple of options here including leveraging LDAP, SAML, or our agent. As you have connected your IT resources to the directory services, now you can assign rights to the appropriate users. The beauty of the platform is the central ability to control access across locations, providers, and specific IT resources. The benefit of a cloud-based directory services platform is the ability to provision and deprovision users easily to the appropriate servers and applications. You create one central identity and leverage that to all of your cloud resources. This enhances security and saves IT admins tremendous time. 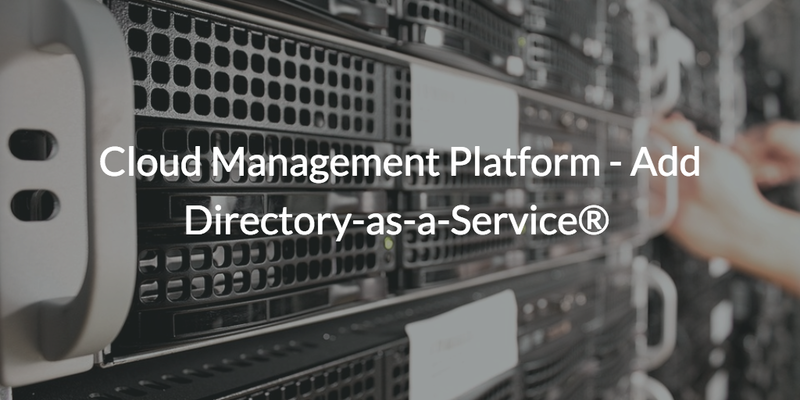 As you think about your cloud management platforms, consider adding Directory-as-a-Service to your toolkit. If you would like to learn more about our cloud management platform, drop us a note. We’d be happy to walk you through how Directory-as-a-Service is changing the game for modern IT organizations. If you are inclined, you can also check out our cloud directory for yourself. Your first 10 users are free forever.